What's wrong with this secretarial pool? 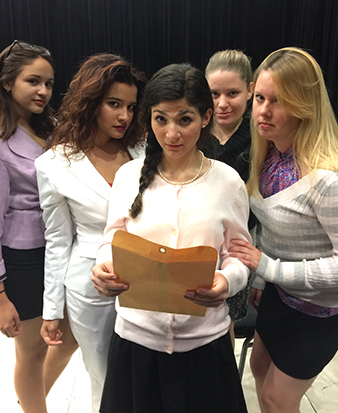 From left, Katherine Beauchamps, Rachel Lemos, Marysa Pratico as "the new girl," Kayla Salcfas and Katie Horahan. Lumberjack Buzz Benikee (Liam McCormack) may be getting more than he bargained for with Patty (Marysa Practico) and her gal pals. West Windsor, N.J. – The secretarial pool at Cooney Lumber Mill sounds like a dream job for young Patty Johnson – until she discovers the darker side of her office gal pals! 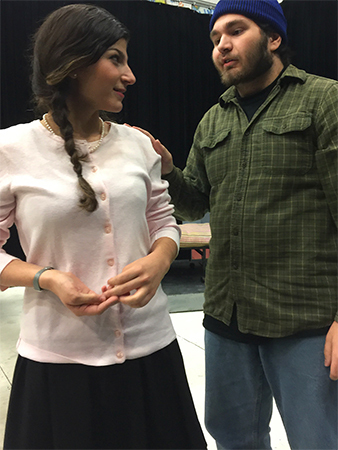 The Mercer County Community College (MCCC) Academic Theatre Program presents “The Secretaries” at the college’s Studio Theatre Friday, Dec. 9 at 8 p.m.; Saturday, Dec. 10 at 8 p.m.; and Sunday, Dec. 11 at 2 p.m. The Studio Theatre is located next to Kelsey Theatre on the college’s West Windsor Campus, 1200 Old Trenton Road. Probing the fine line between female assertiveness and aggression, this sizzling satire was written more than two decades ago, but remains startlingly relevant as it delves into society’s cultural expectations of women. Set in the middle of a seemingly perfect secretarial pool, Patty, “the new girl,” quickly discovers cracks in the office’s perfect façade, starting with the ultra cool office manager Susan Curtis. Then there’s the mandatory diet of Slim-Fast shakes, the strange language the women seem to share – and the monthly disappearance of a lumberjack. Patty soon realizes that these office mates have a “killer” skill set, and it’s not something they can put on their resumes. The ensemble cast includes Marysa Practico of Hamilton as Patty Johnson; Rachel Lemos of Lawrenceville as Susan Curtis; Katherine Beauchamps of Ewing as Ashley Elizabeth Fratangelo; Kayla Salcfas of New Egypt as Peaches Martin; Katie Horahan of East Windsor as Dawn Midnight; and Liam McCormack of Bordentown as Buzz Benikee/Mr. Kembunkscher. Erkoboni is joined on the production team by Producer/Choreographer Jody Gazenbeek-Person, Stage Manager Nicole Schulnick, Set/Costume Designer Kate Pinner, Lighting Designer Star McCloud, Sound Designer Eric Collins, and Props Mistress Madelyn Morrison Lichtman. Tickets are $18 for adults, $16 for seniors, and $14 for students and may be purchased online here or by calling the Kelsey Box Office at 609-570-3333. (This show is appropriate for mature theatergoers who enjoy satire and is not recommended for children.) Kelsey Theatre is wheelchair accessible, with free parking next to the theater. More information about MCCC's Theatre/Dance program is available here. For a complete listing of the college's performance events for adults and children, visit the Kelsey website here.